A spot check by state regulators – spurred by inquiries from The Brew – found the Department of Public Works discharging between 2½ and 4 times the legal limit of chlorinated water into the Jones Falls. 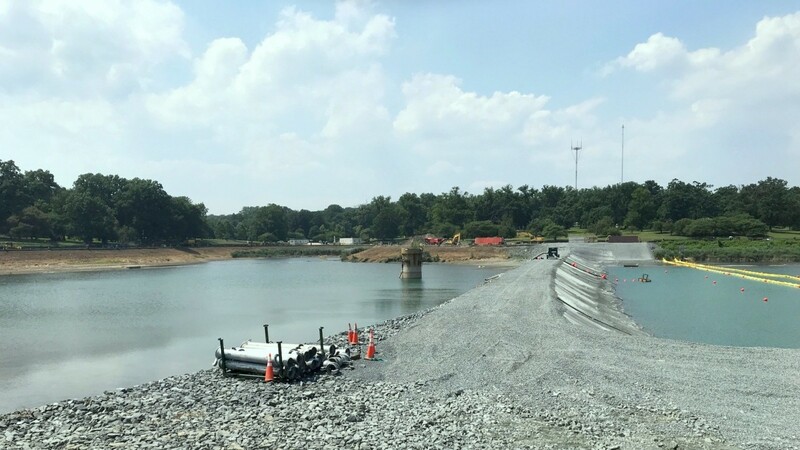 The Maryland Department of the Environment has ordered DPW to stop draining the Druid Lake reservoir following Tuesday’s sampling. This is the second time state regulators have shut down the $135 million reservoir tank project that is designed to enhance the safety and purity of Baltimore’s water supply. Last January, MDE ordered the city to quarantine the east end of Druid Lake after high turbidity levels raised the possibility that viruses, parasites and bacteria could enter into the public drinking water supply. No discharges will resume until the city has an appropriate de-chlorination system in place, says MDE. The chlorine levels found by MDE do not pose a risk to humans, but could damage aquatic life and lead to fish kills. “We are going to go to the Jones Falls to check for any environmental impact,” MDE spokesman Jay Apperson said today. MDE’s finding of high chlorine levels came a week after a DPW official said at a televised City Council hearing that all water dumped from the reservoir was within permitted limits. 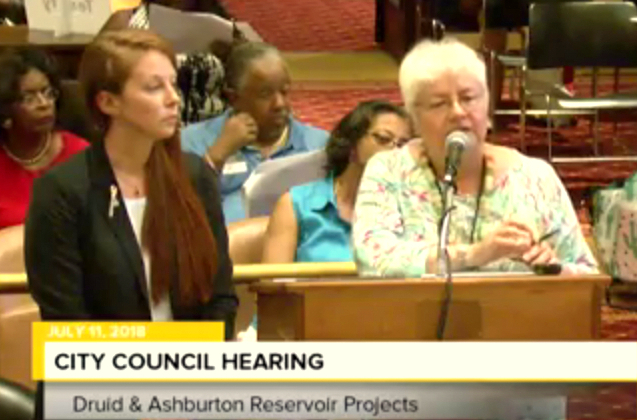 “It’s being sent into a storm drain after it has been de-chlorinated and meets all of the standards of MDE to discharge,” Marcia Collins, DPW director of legislative affairs, told the Judiciary and Legislative Investigations Committee on July 11. After The Brew questioned DPW’s assertion to state regulators, MDE conducted an inspection on July 17. In every sample taken by inspectors, the permitted limit of 0.10 mg/L of chlorine was exceeded, Apperson said. “The results from the different water tanks ranged from 0.25 mg/L to 0.43 mg/L,” he reported – the latter over four times higher than the limit. “We told the city they should cease discharging that day, and they ceased discharging that day. No discharges will resume until the city has an appropriate de-chlorination system in place,” Apperson said. To understand why the chlorine levels were so high, the inspectors questioned the project’s contractor, Texas-based Oscar Renda. The contractor told MDE that “a breach” had been discovered in the newly-finished cofferdam that separates the lake’s west end, which is being drained, from the lake’s east end, which stores finished drinking water and gets doses of chlorine. The contractor said the breach had been repaired, Apperson said, and de-chlorination tablets were placed in tanks that store lake water prior to it being drained into the Jones Falls. On Wednesday, the inspectors returned and found chlorine levels between 0.14 and 0.16 mg/L – much lower than on Tuesday, but still above the 0.10 mg/L maximum. Because of the volume of water that must be discharged from the lake, MDE told Oscar Renda and Whitman, Requardt & Associates, the city’s project consultant, that the tablet method was not feasible. “We have suggested what is known as flow proportional injection and suggested the city contact a water treatment contractor for assistance,” Apperson said. Under the permit granted to the city, DPW was to submit quarterly monitoring reports on its discharges into the Jones Falls (which is under a separate federal consent decree aimed at eliminating the inflow of sewage dumped into the waterway during and after heavy storms). The first monitoring report was due months ago, but has yet to be submitted, Apperson acknowledged. DPW was supposed to submit a report on its water discharges months ago – but never did. • Did Marcia Collins give inaccurate information at last week’s public hearing? • If so, does DPW and Director Rudy Chow plan to correct the record? • Has DPW monitored/sampled the chlorine levels of the discharged water over the last six months? If so, can you send us the results of the sampling/monitoring. • Have the discharges caused fish kills or otherwise damaged aquatic life in the Jones Falls? • How does DPW propose to reduce chlorination to the permitted levels? • Do you still have confidence in the contractor Oscar Renda? So far, the agency has not responded.